Aviation instructors use a training syllabus because as technology advances, training requirements become more demanding. At the same time, new, and often more complicated, rules continue to be proposed and implemented. 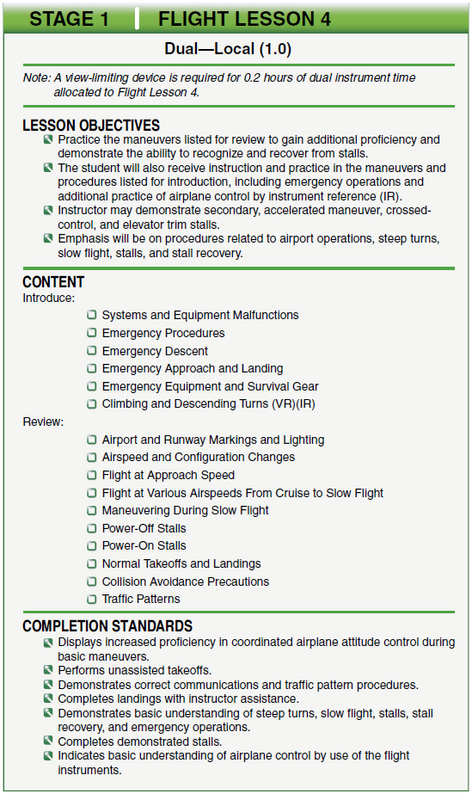 In addition, the rules for instruction in other than an approved aviation school are still quite specific about the type and duration of training. These factors, along with the continuing growth of aviation, add to the complexity of aviation training and certification. Instructors need a practical guide to help them make sure the training is accomplished in a logical sequence and that all of the requirements are completed and properly documented. A well organized, comprehensive syllabus can fulfill these needs. Figure 6-2. This excerpt of a ground lesson shows a unit of ground instruction. In this example, neither the time nor the number of ground training periods to be devoted to the lesson is specified. The lesson should include three parts—objective, content, and completion standards. Syllabi developed for approved flight schools contain specific information that is outlined in 14 CFR parts 141 and 142. In contrast, syllabi designed for training in other than approved schools may not provide certain details such as enrollment prerequisites, planned completion times, and descriptions of checks and tests to measure student accomplishments for each stage of training. Since effective training relies on organized blocks of learning, all syllabi should stress well-defined objectives and standards for each lesson. Appropriate objectives and standards should be established for the overall course, the separate ground and flight segments, and for each stage of training. Other details may be added to a syllabus in order to explain how to use it and describe the pertinent training and reference materials. Examples of the training and reference materials include textbooks, video, compact disks, exams, briefings, and instructional guides. Any practical training syllabus must be flexible and should be used primarily as a guide. [Figure 6-3] When necessary, the order of training can and should be altered to suit the progress of the student and the demands of special circumstances. For example, previous experience or different rates of learning often require some alteration or repetition to fit individual students. The syllabus should also be flexible enough so it can be adapted to weather variations, aircraft availability, and scheduling changes without disrupting the teaching process or completely suspending training. Figure 6-3. The curriculum and training syllabus provide teaching guidelines. In departing from the order prescribed by the syllabus, however, it is the responsibility of the instructor to consider how the relationships of the blocks of learning are affected. For example, if the student is having a difficult time with normal approaches and landings, the instructor might decide to delay adding short field landings, which were originally to be the next step in his block of instruction. To prevent the student from becoming frustrated with his or her poor landing technique, the instructor may choose to review the block on slow flight, which offers the student a chance to do well and regain confidence. This exercise also builds the skills necessary for the student to master approaches and normal landings. Each approved training course provided by a certificated aviation school should be conducted in accordance with a training syllabus specifically approved by the FAA. At certificated schools, the syllabus is a key part of the training course outline. The instructional facilities, airport, aircraft, and instructor personnel must be able to support the course of training specified in the syllabus. Compliance with the appropriate, approved syllabus is a condition for graduation from such courses. Therefore, effective use of a syllabus requires that it be referred to throughout the entire course of training. Both the instructor and the student should have a copy of the approved syllabus. However, as previously mentioned, adherence to a syllabus should not be so stringent that it becomes inflexible or unchangeable. It must be flexible enough to adapt to the special needs of individual students. Ground training lessons and classroom lectures concentrate on the cognitive domain of learning. A typical lesson might include defining, labeling, or listing what the student has learned so far. Many of the knowledge areas are directly or indirectly concerned with safety, ADM, and judgment. Since these subjects are associated with the affective domain of learning (emotion), instructors who find a way to stress safety, ADM, and judgment, along with the traditional aviation subjects, can favorably influence a student’s attitude, beliefs, and values. Flight training lessons or aviation technical lab sessions also include knowledge areas, but they generally emphasize the psychomotor domain of learning because the student is “doing” something. 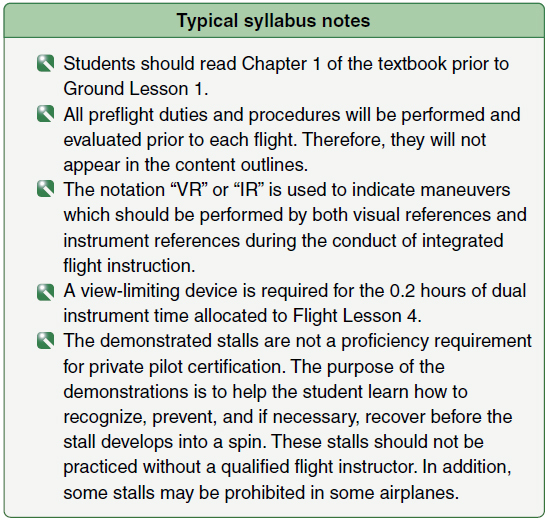 The lesson plan shown in Figure 6-4 shows the main elements of a ground lesson for a flight student. The affective domain of learning is also important in this type of training; a student’s attitude toward safety, ADM, and judgment, should be a major concern of the instructor. Figure 6-4. A flight training lesson, like a ground training lesson, should include an objective, content, and completion standards. More than one objective could, and often does, apply to a single flight lesson. 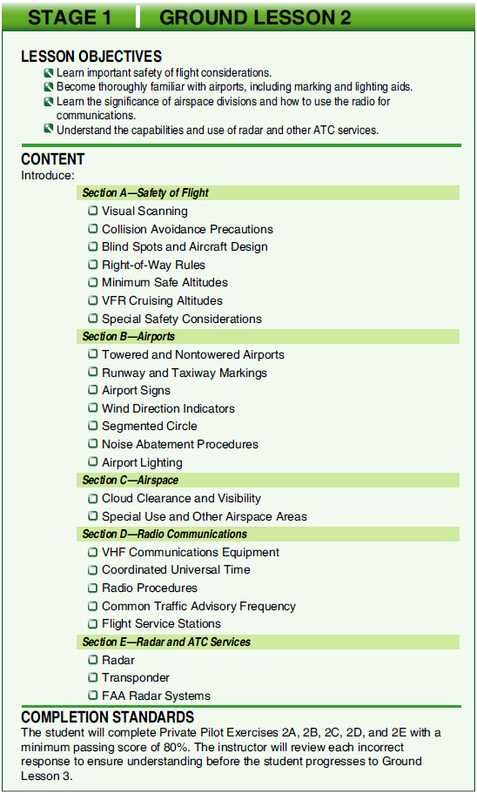 The flight training syllabus should include special emphasis items that have been determined to be cause factors in aircraft accidents or incidents. For example, the instructor should emphasize collision and wake turbulence avoidance procedures throughout a student’s flight training. The aviation technician syllabus should also emphasize what constitutes unsafe practices, such the ease of introducing foreign object damage (FOD) to an aircraft when the location of tools is not monitored. Figure 6-5. 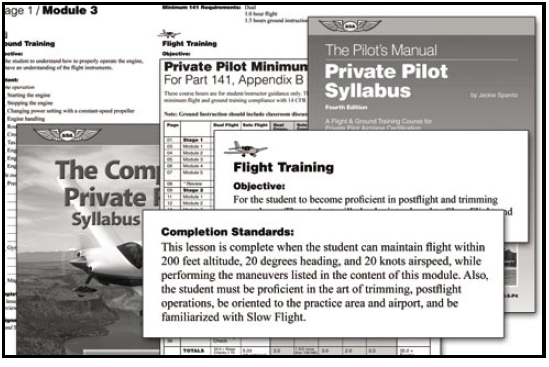 Information in the form of notes may be added to individual ground or flight lessons in a syllabus when they are necessary. While a syllabus is designed to provide a road map showing how to accomplish the overall objective of a course of training, it may be useful for other purposes. 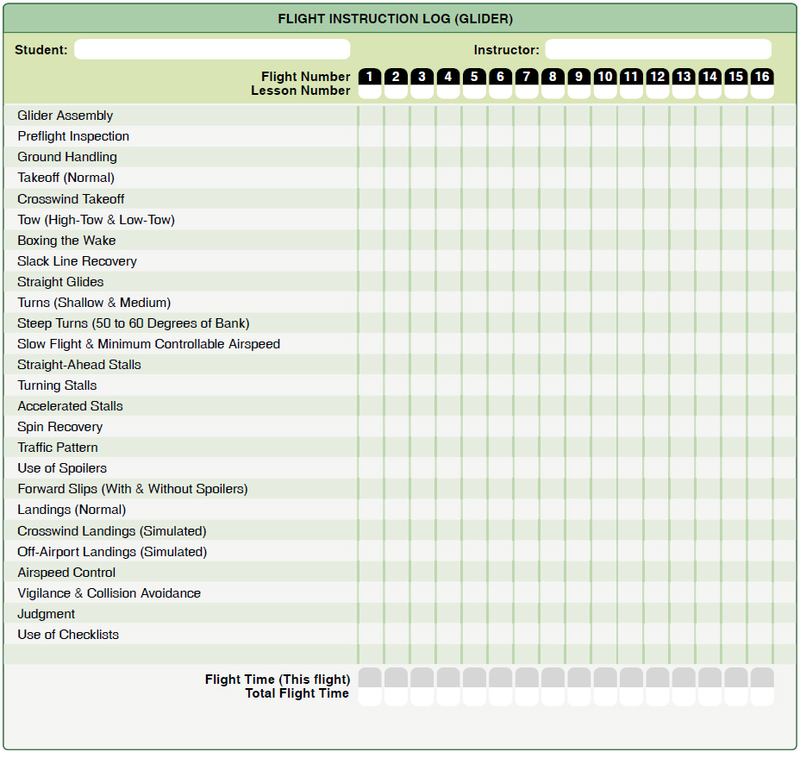 As already mentioned, it can be used as a checklist to ensure that required training has successfully been completed. Thus, a syllabus can be an effective tool for recordkeeping. Enhanced syllabi, which also are designed for recordkeeping, can be very beneficial to the independent instructor. Another benefit of using a syllabus is that it helps in the development of lesson plans. A well constructed syllabus already contains much of the essential information that is required in a lesson plan, including objectives, content, and completion standards.